Always looking back to photos from the past. They bring smiles to my face and a wonder to my heart that I've been blessed to travel as much as I have. Fortunately I found a husband who was willing to travel also, even though he'd never done any of it unless it was with a school group. I grew up loving to travel. Don't know where the delight came from since we never took family vacations, but my dad would go to Ocean City, MD every year for deep sea fishing and when I got to age 11, he would take me along. My mother always said her vacation was having us gone. She was one of those old-fashioned housewives who did everything, so not having to cook on schedule she felt like she was on vacation. When I got into my 20's dad and I would plan trips together. He definitely had a travel bug too, so I guess it was in him, although he only ever took that one vacation week annually. He even traveled with me from Atlanta down through Mexico towns all the way to Acapulco in my newly purchased car. I was living in Atlanta at that time. Those Mexico roads had no side rails and they were winding mountain roads. Crazy! 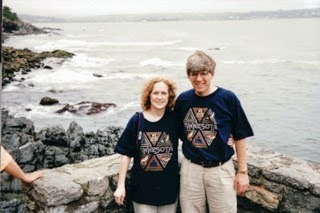 This spot in Newport, Rhode Island, was really special. I love rocky coastal views of the ocean (like in Maine). There were beautiful homes along the streets above this spot. We had been visiting with a friend, so it was nice that she could join us and guide us around the town. I love seagulls also. I like New England, but wouldn't want to live there due to the long winters. View Plymouth, MA - Plymouth Rock and Seacoast Area. View New Haven, CT - Yale University & Lighthouse Point. Randal left for Oklahoma City on Saturday. Not what you'd call a fun trip. He will be helping his brother move their parents to a long-term care place rather than the assisted living arrangement they have now. His dad has gone into Hospice care. His dad's been totally blind for the past few months and that has been very difficult on him. Seems he headed downhill shortly thereafter. He's 88. It's certainly been hard on Randal's mom since they depended on each other for various things. His Dad has been placed under Hospice care. 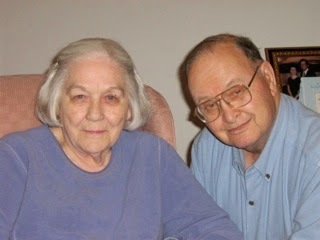 Our son lives in Oklahoma City also and has grown very close to his grandparents, so it's a difficult time for all. I'd appreciate your prayers if the Holy Spirit brings them to mind. Thanks! We took an overnight trip for Labor Day weekend to Hampton (2.5 hours). Had a few nature trails to hike but it turned out pretty hot and I'm not fond of the sun, although it seems that the areas of my skin that had lost pigment (condition called vitiligo) are beginning to fill in a polka dot of pigment at a time. I've been expecting healing. For 38 years I've had to avoid the sun due to the dermatologist informing me along with a bunch of reading materials that I was open for instant skin cancer since I had no pigment to offer any protection. I lived that way, considering cloudy days a real blessing, until not long ago. Living in Virginia hasn't had the blazing sun we had in Alabama and Georgia and with a shaded yard with only patches of sunlight I've been boldly stepping out. I am light-skinned so it isn't as noticeable as it is on darker-skinned people unless I tan. So it's a toss up between my vanity and my love of the outdoors. But now, I see I am in the process of healing and am very excited. When we got to the turnoff for our first stop in Hampton, VA, we went the wrong direction and headed over the James River Bridge before realizing we were going south instead of north. The drive across the bridge was nice. When completed in 1928, the 4.5-mile (7 km) bridge was the longest bridge in the world over water. On the way back I noticed that there were seagulls on the top of the light posts. It was really funny to see. Each lamp had one seagull as if it was standing guard in a lighthouse or something. I wonder if they sleep there in winter since the warmth from the lights would make it a bit more cozy than many places. 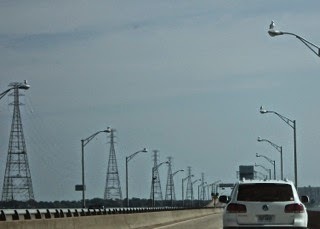 The enlarged view of the photo shows them lined up on both sides of the bridge. When we finally arrived at Grandview Nature Preserve it was hot. We'd been there before in January 2007, but this was not the entrance we used. This one was super sunny and bare of any shade. The trail had no view of the wetlands due to tall marsh grasses. I couldn't find anything on Google about another entrance or a closed entrance. People were hitting the trail with beach attire, coolers and chairs. The most interesting thing we saw was this party of three coming out as we came into the trail. One lady barely had a bikini staying with her and a man followed behind along with two dogs ... uh! ... one dog and one pig. I did a double take. It was really funny. 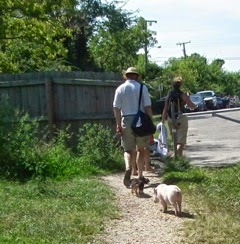 The pig just followed along behind the dog. So cute! We didn't get too far before we turned around for the car. The heat had me moving at a snail's pace and I couldn't breathe. I added the few photos I took to the original album of our first trip. View Grandview Nature Preserve Photos. There was a stream on the side of the street we parked on ... more mud than running water, and Randal's eye noticed a bunch of crabs coming out of the mud and running up a hill. I assumed they were Mud Crabs which we had seen before in SC. I did get a picture but the video of mud crabs in SC is much better. 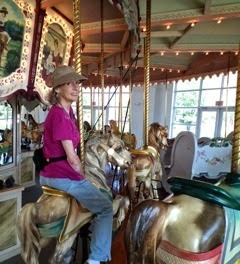 The special highlight of the day was getting to ride a horse on a restored 1920's carousel. It was indoors with air conditioning ... so it was hard not to linger after the ride was over. You can see how delighted I was about being on one of the carousel horses. When I was a young child, we would go to Hershey Amusement Park (what it was called in the 50's). My mom wouldn't ride anything but the carousel and she sat in one of those benches like you see in the photo while Daddy and I went up and down. It was a very special memory to be able to do this. The historical info on the carousel is very interesting ... if you have a sweet carousel memory of your own. This carousel was built near Philadelphia which was not far from where I lived growing up, so that made it even more special. I have put a lot of info on the photo titles. Also in the Carousel Park was a 400th City of Hampton Anniversary Commemorative Area with monuments. View Carousel Park and Carousel Photos. We visited a couple more places but I will share that information and photo links in the next newsletter. It takes me some time to get all the historical data in the photo captions. Every year during summer we have an issue with fruit flies since we bring in a lot of fruit to this house in bulk quantities, so the fruit flies don't get a chance to vacation elsewhere. I can handle about 20 of them and after that they begin to get on other stuff, like the plate of food I have ready to take to the screened porch, but left on the counter till I get my herbs. In a split second they will find anything that has fruit. So ... we use a simple approach to limiting populations with vinegar. We tried it with white vinegar and it doesn't work much at all. Read the article: Make a Apple Cider Vinegar Trap for Fruit Flies. We also use a small marinated artichoke hearts jar with a few small holes punched in the lid, again big enough for them to get through but not come back out. That works rather well and we can keep it for next year all ready to go. We have deer on our property all day long. 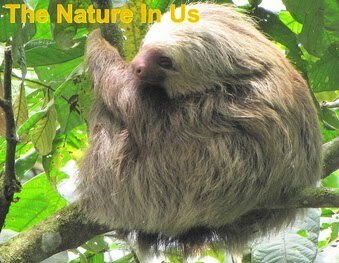 Sometimes they will be resting in the back woods and sometimes foraging amongst our garden plants in the front. They like the water from the pond out back and also the area where we throw our fruit and veggie scraps, so they are one of many that check out the "salad bar" daily. 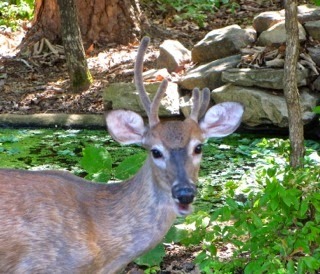 This young guy is easy to recognize since he's got such short antlers on one side of his head. I'd seen some before that weren't quite as tall, but not like this where it's less than half as tall as the other side. They're all cute though. It's such a blessing to be able to be surrounded by God's creatures as I spend as much time on outdoor activities that I can since I love the screened porch. I do all my computer work out there and reading and writing and playing with the cat. The best part is watching all that is going on around me on the attached deck and in the back woods and bird feeders. If you build it (no matter how small) they will come. Even an apartment balcony can attract many species of birds and pollinators. Get information on how to attract them in your area of the country: Free Pollinator Friendly Planting Guides. One of my birthday gifts was from my friend, Christina, in Texas. 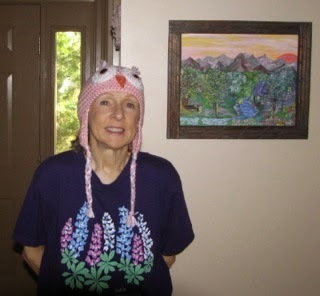 She's real artsy and makes jewelry, does wall murals and paintings on canvas, and all kinds of crocheted things which includes the owl cap you see in the photo. I think it's absolutely adorable and a fun thing to wear. 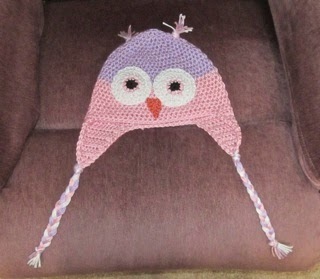 My husband asked if I was going to wear it "out and about" and I said, "What a hoot that will be" (pun intended). Reminds me of the poem about when you get old and wear purple and red together. Our son wanted to see me wearing this, so my sweet husband took a photo of me with it on. It feels really comfortable and I can tell it will be a nice addition to my winter days. By the way, the painting next to me is one that was done by Christina. Take a look at her Etsy website. Maybe you can buy some early Christmas gifts. Have you ever wondered why some of your emails end up in people's spam folders or are marked as junk when they come into a person's desktop email? Somebody shared a web link where you can check to see if your email address has ever been 'pwned.' I checked mine and found it had been pwned on two sites out there in cyberland. The email address and my password were taken on both. That means I need to change my password and if I've used the same password on other websites, those need to be changed also. Maybe you want to check to see if your email address has been pwned. It seems I've graduated from my admonition from God to "trust and rest." I had been hearing that for over a year and it took most of that year to realize that I didn't really trust anybody in my life and to gain a concept of what trusting really meant. I came to realize that it was a foreign concept to me. 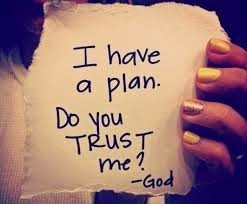 I shared about that in my blog post, Do You Really Trust God? My new "assignment" is to focus on expecting good from God. To truly begin to grasp how worthy I am in Christ so that I can begin to live the life of abundance that Christ said He came to give us. We are so performance-motivated from the time we're young children, we "earn" things by being good and we get punished by being bad. School, work, laws, and even relationships enforce this concept. So, it's easy to see why it's so hard to understand unconditional love with a mind that's established in performance. I've been meditating on I Cor. 2:9: "Eye hath not seen, nor ear heard, neither have entered into the heart of man, the things which God hath prepared for them that love Him." The imagination can go wild soaking this up. It's not about material things but just that the God of the Universe loves us so much he has stored up things for us when we are in a love relationship with Him. Most folks don't go on to the next verse after quoting this ... but verse 10 says that "God hath revealed them unto us by His Spirit: for the Spirit searches all things, yea, the deep things of God." Jesus told His disciples that when He left He would send the Comforter, the Holy Spirit. He is the one who teaches us all things (John 14:26). It's so important to take time to be tuned into God. He is always speaking to us through His Spirit, but we allow our minds to be busy with day-to-day stuff and don't take time to be still and know what He is saying. We worry about things in the future and the Bible tells us that the Holy Spirit will tell us of things to come, so we can know the future and be at peace with life. May your days be blessed with His still small voice and your circumstances fade into nothing compared to being loved by God. Have a blessed time with the Lord this week.